Everest Base Camp Trek 14 days (EBC Trekking) leads to the astonishing area of base camp where expedition. 14 days Everest Base Camp Trek passes through the homeland of the famed Sherpa ethnicity. Check our 14 days Everest Base Camp trekking to know cost and itinerary. High altitude trek to Everest Base Camp (5,359 metres) and Kalapathar (5,545 metres). Offers magnificent views of more than 40 peaks including three of the world’s highest (those above 8000 metres): Mt Everest, Mt Lohtse and Mt Makalu. Takes to Khumbu Glacier (14 km long and 420 metres deep). Passes through a number of Sherpa villages, including Namche Bazar the gateway to Everest. Everest Base Camp Trek 14 days leads to the astonishing area of the base camp where expeditions set up to attempt the summit of the world's highest peak, Everest. The route up to this historic area offers unforgettable beauty in the alpine paradise of the Himalaya. The base of the world's highest peak is the very nearest to the summit that trekkers can reach without being a mountain climber on an expedition. The majestic natural surroundings bring travelers from all over the globe to admire the beauty and setting of the world's most famous climb. From Everest Base Camp, we will have up-close views of the challenging Khumbu Icefall and the desolate surroundings. Our 14 days Everest Base Camp Trekking includes some of the best mountain scenery in the Himalaya. The celebrated viewpoint of Kala Patthar (5545 mt, 18192 ft), offers up-close panoramas of Everest and surrounding mountains! At the base of the peaks is the scenic Khumbu Glacial Valley. Along with this trek, we will have memorable views of lofty peaks that soar into the blue sky. This Everest Base Camp Trek in 14 days passes through the homeland of the famed Sherpa ethnicity. The Sherpa are especially renowned for their mountain skills. The Everest Base Camp Trekking gives us a chance to observe the Sherpa lifestyle with wondrous Buddhist monasteries. Wildlife in this area includes exotic alpine animals including the elusive snow leopard and some people even think the yeti lives in the Himalaya here. Our Everest Base Camp Trekking starts after a short, scenic flight over terraced farmland to the mountain airport of Lukla. We then take our time as we allow adequate time to adjust to the high elevation. We trek north up the Dudh Kosi Valley to the destination known as Namche Bazaar, a town at the gateway to the higher Himalaya. After visiting the famous Sherpa villages of Kunde and Khumjung we continue to the famous setting of Tengboche Monastery, the largest monastery in the region. From here the trail becomes more desolate as we move higher and closer to the expedition base camp of the highest peak on earth. Everest Base Camp is the highest point of our trek and a thrilling achievement. We enjoy the moment and the surrounding natural splendor along with views from nearby Kala Patthar. Then we make a pleasant return journey to Namche Bazaar and a finally a scenic flight from the mountain airport at Lukla. Recommended: Add a cushion of a few extra days in your onward travel schedule, advised as a margin of safety for your international flight from Nepal. Air travel between Kathmandu to Lukla is frequently delayed due to weather conditions and poor visibility. Flights often get behind schedule and delays can even last for days. Under these situations, High Camp Adventure will do its best to re-schedule flights to and from Lukla at first availability. However, the possibility of postponements of flights and even cancellations is a real possibility. We, therefore, advise that you schedule at least an extra two days cushion in your itinerary to avoid conflicts with international flights out of Nepal. In the event of prolonged delays, one option is to arrange a helicopter evacuation at your request. The additional cost of a helicopter flight would be between 500 to 1000 USD per traveler, exact cost dependent on demand and capacity. That said, we would also like to mention that it is also likely that there will be no delays whatsoever. In that case, High Camp Adventure can arrange activities with your additional days in Kathmandu before your flight home. 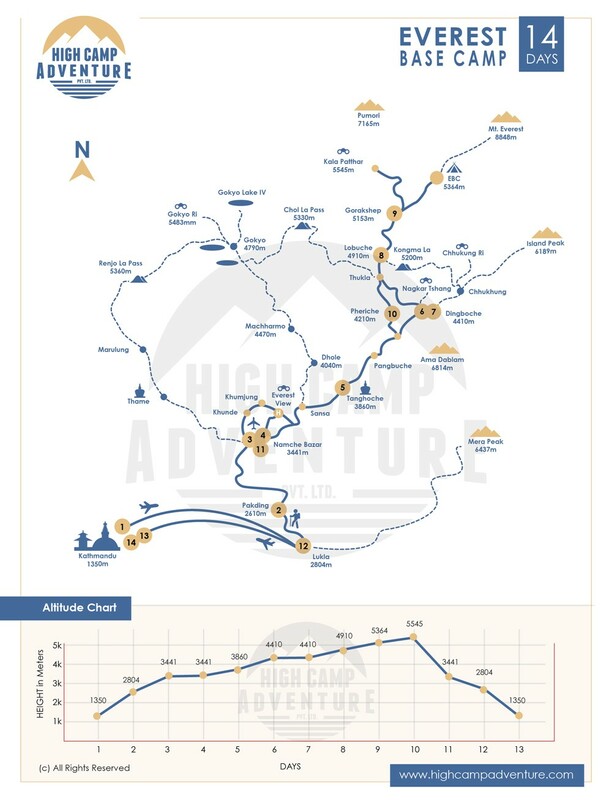 Please Note: Our Everest Base Camp Trekking has set departure dates from Kathmandu and this trek can be personalized to accommodate your specific wishes and timetable. Day 08Dingboche to Lobuche (4910 mt.). Walking 4 ½ hours. Overnight at guest house. Day 10Hike up to Kalapatthar (5545 mt.) in the morning and retreat trek to Pheriche (4210 mt.). Walking 7 hours. Overnight at guest house. Day 11Pheriche to Namche Bazar. Overnight at guest house. Day 12Namche Bazar to Lukla. Overnight at guest house. Day 3Phakding to Namche Bazar (3441 mt.). Walking 6 hours. Overnight at guest house.Along the banks of the Dudhkoshi River and over a number of suspension bridges, the route enters and leaves Monjo Village on the way and heads for Jorsalle, where we stop for lunch. After lunch in this only settlement until Namche Bazaar, we move on. The pine forest, perhaps, is the only relief in those final two hours of the steep demanding climb just before the arrival of Namche. This headquarters of the Khumbu Region where we stop for the night. Day 4Acclimatization day in Namche Bazar. Overnight at guest house.The day today is for acclimatization. Once in higher altitudes, it is important that we allow the body the opportunity to adapt since the amount of oxygen in the air now becomes less and less. This process requires us to walk higher up but come down for the night. As a part of this process, we first visit the Sagarmatha National Park Museum, where those of us interested get to know about the landscape, wildlife and people for whom the Everest Region is a home. After this visit, we go further up to Everest View Hotel. This is a location that offers a spectacular view of the Himalayas in its proximity including Mt Everest, Mt Lhotsé and the awesome Mt Ama Dablam. The Khumjung Valley, along with its famous Monastery, is yet another sight most find intriguing. After we return, a walk around the bazaar keeps many travelers engaged in one or the other acts of personal interest. Day 5Namche Bazar to Tengboche (3860 mt.). Walking 5 hours. Overnight at guest house.Our stop for lunch today is Phunke Thanga, a small settlement, around three hours away. With pines and rhododendrons thick in the area and the raging Dudhkoshi somewhere close, a lunch here in PhortseTenga is something of an experience. On a sharp ascent and still through forests, Tengboche is yet another three hours from here on. With its highly revered Monastery, the biggest in the area, along with a breathtaking view of Mt Ama Dablam, the village is certain to inspire many upon arrival. Tengboche is where we spend the night. Day 6Tengboche to Dingboche (4410 mt.). Walking 5 hours. Overnight at guest house.Pangboche, our stopover for lunch today, is around three hours away. Downhill to Deboche then up a gentle prolonged incline, from end to end of patches of forests along the way and crossing a suspension bridge, we arrive in Pangboche. After a decent lunch, it’s three hours to Dingboche in the presence of the majestic Mt Ama Dablam. Dingboche, with around forty households, is home to approximately two hundred locals. This is where we stop for the night. Day 8Dingboche to Lobuche (4910 mt.). Walking 4 ½ hours. Overnight at guest house.Before that demanding ascent to Dugla, we pass a Chorten and some memorials on the way. After a steep uphill to ChukpoLari, the trail arrives in Lobuchéwith the walk for the last twenty minutes or so gentle on the legs. Lobuche, where we stop for the night, is a very small settlement with only two or three constructions. Mt Nuptse close by, however, sufficiently keeps everyone engaged. Day 10Hike up to Kalapatthar (5545 mt.) in the morning and retreat trek to Pheriche (4210 mt.). Walking 7 hours. Overnight at guest house.Today’s early morning is for that two-hour climb to Kala Patthar almost four hundred meters up. The famous vantage point is famous for a good reason: surrounded by all those gigantic elevations including two of those that have risen more than 8000 meters, Mt Everest and Mt Lhotse. Back in Gorakshep for breakfast and we head off to Pheriche, starting off by entering the glacial valley. It is in one of the many lodges that the village has on offer that we stop for the night. Day 11Pheriche to Namche Bazar. Overnight at guest house.A downhill to Tengboche for lunch and we retrace our footsteps to Namche Bazaar. This is where we stop for the night. Day 12Namche Bazar to Lukla. Overnight at guest house.Stopping only in Phakding Village for lunch, the walk back to Lukla takes about seven hours to some and eight to others. Day 14Transfer to airport for your final departure from Nepal.Depending largely on your travel fixture, you will be leaving for Tribhuvan International Airport for your departure from Nepal either in the morning or in the afternoon or in the evening. Please take a look at our fixed departure dates for this Everest Base Camp trek. If they do not fit with your schedule, then please let us arrange an itinerary that is more suitable to you and your requirements. An experienced and licensed Guide and necessary porters will assist you during the trek. In a group with more than 8 clients, 2 guides will be provided for the betterment in service. In a teahouse trek, generally, one porter is provided for every two clients who carry between 15 to 20 kg. However, on a camping journey, more porters are required. All the camping pieces of equipment such as kitchen, dining, dome and toilet tents, kitchen equipment, fuel, and all consumable goods have to be carried from Kathmandu which needs more manpower. All of our guides and porters are fully insured so you don't' have to worry about them in case of emergency. Our team believes that our customer care is the first priority. Everest Base Camp Trek is a moderate trek which is fit for those who has the ability to walk 5-6 hours of walking uphill and downhill in a day carrying a personal day pack. Some days are longer with 7- 8 hours of walking as well. Everest Base Camp Trek is high altitude trek which demands more physical, however having strong determination, positive vibe and average physical fitness can complete this trek. Some time mental aspects also play a vital roll in an altitude. Doing some physical exercise a few weeks prior to the trip is better but technical skill is not required for this trek. If you are taking medicine for heart, lung or blood diseases, please kindly consult your doctor and inform to High Camp Adventure. Spring (March to May) and Autumn (September to November) are the best months for Everest Base Camp Trek. Where normally days are sunny, the temperature is perfect, the sky is clear and Mountain remains crystal. This trek can be done in Monsoon (June to August ) but you should not expect the great weather and Mountain view. You can do it in Winter (December to February) if you are used to with extreme cold temperature. Add a cushion of a few extra days in your onward travel schedule, advised as a margin of safety for your international flight from Nepal. Air travel between Lukla to Kathmandu is frequently delayed due to weather conditions and poor visibility. Flights often get behind schedule and delays can even last for days. Under these situations, High Camp Adventure will do its best to re-schedule flights to and from Lukla at first availability. However, the possibility of postponements of flights and even cancellations is a real possibility. We, therefore, advise that you schedule at least an extra two days cushion in your itinerary to avoid conflicts with international flights out of Nepal. In that case, High Camp Adventure can arrange activities with your additional days in Kathmandu before your flight home.